Each Jewish holiday is a lesson in life. On Sukkot, we learn about joy in life. On Rosh Hashana, it’s goals. Yom Kippur is about learning from our mistakes. Passover is all about freedom. It’s the type of freedom that has given the Jewish people it s power to survive and to thrive. It’s not a freedom of the body as much as a freedom of the spirit. And this same freedom is available at Passover to help you achieve whatever you want. A person with true freedom knows no bounds. They are free to change themselves and change the world! Passover is a “virtual reality experience” in freedom — and the Haggadah is our guidebook. The Seder reenacts the transformation of leaving Egypt, from slavery to freedom. Through this reenactment, we can achieve for ourselves what the Jewish people achieved 3,500 year ago. That freedom brought about the greatest and longest standing empire in the world’s history. Not an empire of space but an empire of thought — Jewish thought. The story of Passover is the story of the beginnings of the Jewish people, a people that set out to form a new world order with a new morality and new concepts of life. The old world was a pagan one, where war and violence were not only ways of life but often national pastimes. The world the Jews ushered in includes ideas with which we are all familiar — equal rights, universal education, social responsibility, and peace for mankind. Passover is a mind holiday. Slavery takes many forms; not all shackles are made of iron. We have to become free — not from a physical oppressor, but from a spiritual, mental one. It’s ideas that enslave us. Pressures, self-imposed limits — all these are in our mind. Once slavery becomes a way of life, the slave may even become unaware of his own servitude. That’s why the Haggadah encourages us to ask questions to exercise our mind. So as you encounter questions throughout the Haggadah, take them seriously. Try to answer them, and encourage others to ask more questions. You just don’t know which question you are going to ask (or be asked) that will set you free. Give each of the guests some candies before the Seder starts, so that they can toss at whoever asks a good question. This is a particularly effective way of keeping children interested. The key is that the Seder should be relevant, not dry and boring. Read ahead, familiarize yourself with the text and look for interesting questions to discuss during the Seder. Circle those points you want to read out during the Seder and write in your own comments. That’s because it was, and is. It’s a conversation with your inner self. 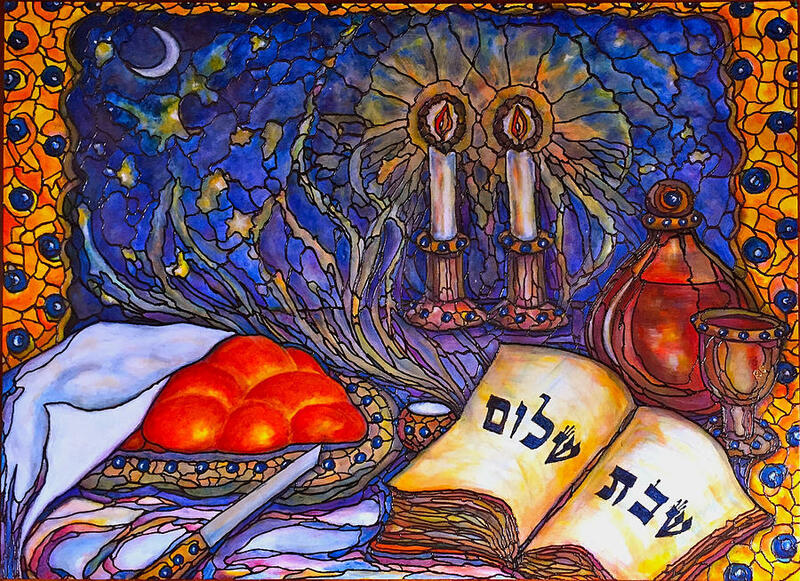 If you are thinking at the Seder, then the Haggadah seminar is sure to show you how to let yourself be truly free. Why is this Exile Different? On all other nights we eat bread or matzah, but tonight we eat only matzah. On all other nights we eat all kinds of vegetables, but tonight we eat only marror (bitter herbs). On all other nights we don’t dip our food even once, but tonight we dip it twice. On all other nights we sit or recline at the table, but tonight we all recline. It is generally assumed that the “Avadim Hayinu” (“We were slaves”) paragraph that follows the Four Questions is an explanation for the puzzling differences that have just been mentioned. We already know two elements that distinguish our current Jewish exile (now 2,000 years) from previous ones. First, it is much longer than any other exile we have experienced, and we also don’t know when it will end. (Previous generations in exile had prophets who could foresee when redemption would come.) Why is this exile so much longer than previous exiles, and why were we not informed of its end? Matzah, which contains only the simplest of ingredients (flour and water), represents unity. Leavened bread (chametz) contains many more ingredients. This represents many different opinions, which can lead to dissent and fragmentation. In all other exiles, we ate both matza and chametz; sometimes we were more unified, and sometimes we were less. Tonight, in this exile, the situation is different. We have so much fragmentation that we need to eat only matzah! We are so filled with chametz that we must eat matzah in order to counteract all the disunity around us. Maror represents the pursuit of money and materialism. In all other exiles, people ate many different kinds of vegetables, meaning that they were able to get by with the bare necessities. Tonight, in this exile, we eat only maror, representing the bitterness of people who spend their lives chasing after material wealth. The Sages in Pirkei Avot say, “Who is rich? The one who is happy with his portion.” This exile is especially bitter because we are perpetually dissatisfied with what we have. Dipping represents physical pleasures and passions. Previous generations were not as thoroughly directed by their passions as we are in this exile. In previous exiles, people didn’t dip their food even once. Tonight, in this exile, we dip it twice! We are steeped in a culture that glorifies the pursuit of pleasure. Reclining represents pride and haughtiness. Previous generations either sat or reclined; at times, people were arrogant and other times people were humble. Tonight, in this exile, we all recline. We are so proud of our possessions and accomplishments, that we don’t even feel we are in exile. May we all be blessed this Passover to climb the spiritual ladder of success that is outlined in the 15 stages of the Seder. May we rid ourselves of disputes, materialism, passions and pride. May we let go of all the spiritual impurity we have experienced during this long exile, and celebrate redemption by purging ourselves of the “Egypt” that has taken root within us. Different things are expected from different people. In this week’s parsha, we learn that God wants us to always try to do our best according to our abilities. Nothing more — and nothing less. Rebecca spread out the bright, red-checkered tablecloth on the ground and plunked down the cooler full of fresh made sandwiches and other goodies. She and her brother, Gary, had decided to take advantage of the beautiful early spring afternoon by going on a picnic in the woods behind their house. “What’ll it be — cheese or peanut butter and jelly?” Rebecca asked. Gary didn’t say anything. He just sat there rubbing his hand through the grass distractedly. “Hey, what’s with you? Whenever we go on picnics, you usually dive into the cooler before I can even put it down, and today you’re Mr. Gloom and Doom,” she said as she set out the sandwiches and drinks, carefully checking the tablecloth for ants first. “Why not?” “Because Davy studied like crazy for that test. I even got up in the middle of the night once last week to get a drink and saw Davy still sitting at his desk with his math book! Between you and me, Gary, did you even take your math book out of you book bag once to study for that test?” “Of course I did!” Gary protested. “Really?” Becky said while giving him one of her x-ray vision stares. “But a blade of grass is a blade of grass. Is it my problem that I’m bigger than the ant?” Rebecca smiled and threw the piece of grass at her brother like a spear. Ages 3 – 5 How did Gary feel at first about the test he brought home? Ages 6 – 9 Who should feel better: someone who succeeds at something without trying, or someone who tries his best but fails? Why? Ages 10 and up How can we know whether or not we are fulfilling our potential? Sam picked up his wife Becky and their new baby from hospital and brought them home. It was not long before Becky suggested that Sam try his hand at changing a diaper. The next time soon came around so Becky asked him again. A great way to send a greeting and support Aish! Send a mazel tov, condolence or simply show your appreciation to a relative or friend with an Aish Tribute. It’s easy — just call the Aish office at 314-862-2474 or email us at stlouis@aish.com. Donate any sum (we suggest $18) and we will send a card to your designated recipient and publish it in our newsletter.